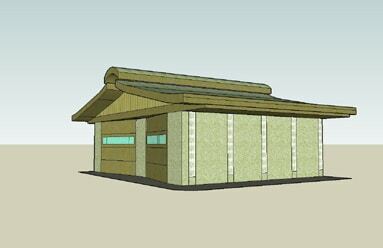 This is the 3-D model for Gary’s rammed earth garage on Salt Spring Island, B.C. 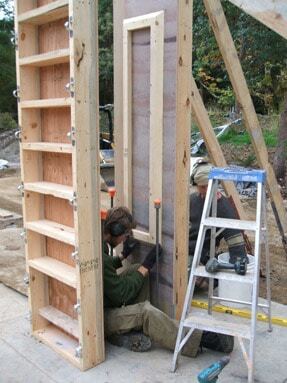 This is building is not insulated so we decided to use a 1′ wall thickness on this project. 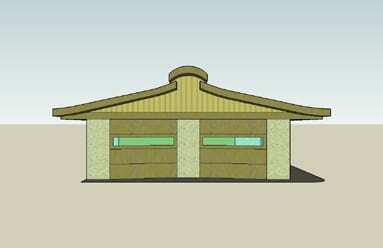 The Garage doors are slanted in for both aesthetic and practical site constraints. 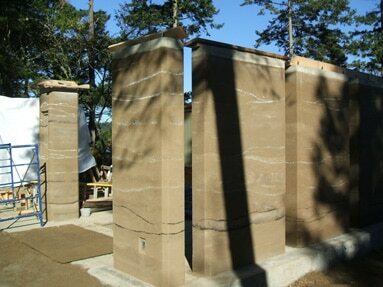 You will notice as the pictures come in of the completed project that there has been a deviation from the original design but this was the original intention when we started. The view of the garage from the south. A perspective view from the south east, those are glass block windows on the side for those who are wondering. 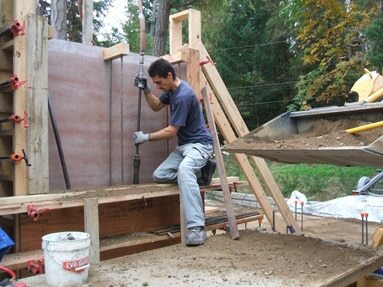 Gary’s rammed earth garage is on Salt Spring Island, BC. 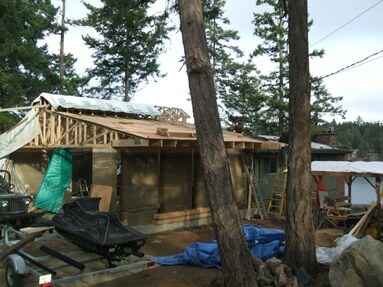 The foundation is done and now on to building the walls and roof. The garage walls have no insulation inside and are 1′ thick, with the exception of the pillar between the garage doors, which is 2′ thick. 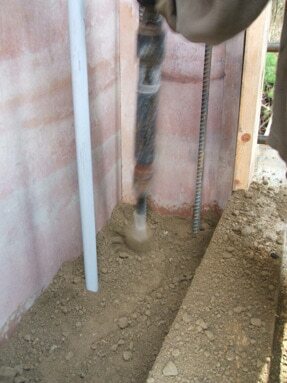 The rammed earth mix is given a light spray as it’s turned. 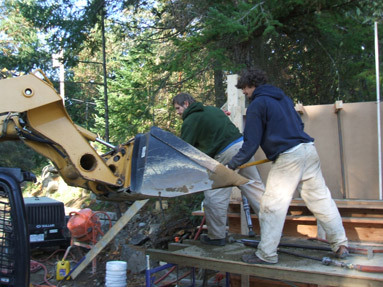 Shoveling material into the forms. 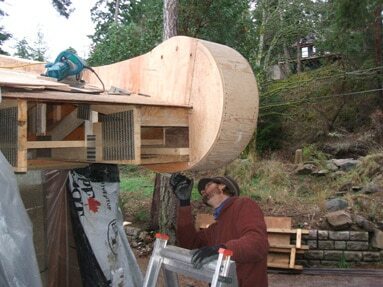 Installing the chamfers for the pillar detail. 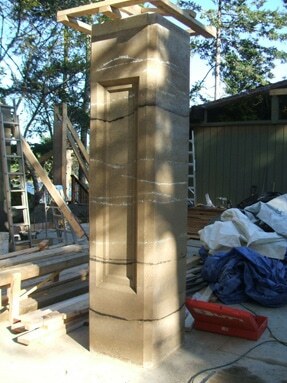 The pillar looks great with the double chamfer detail. 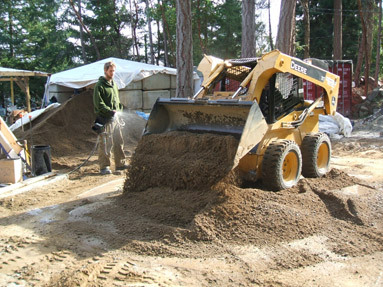 The pneumatic tamper is fast, you can see the trail it leaves as it compacts. A good picture of the wall texture. 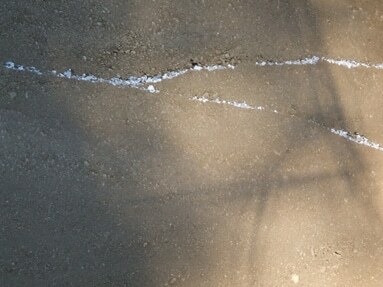 The highlight layers are a mix of crushed white and gray limestone. 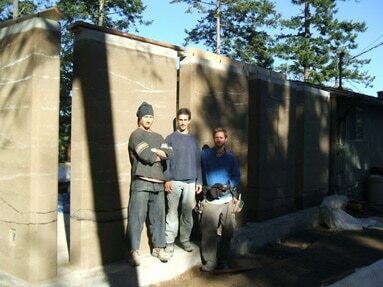 Rudy, Clifton and Yashwant..the core building crew on this project. 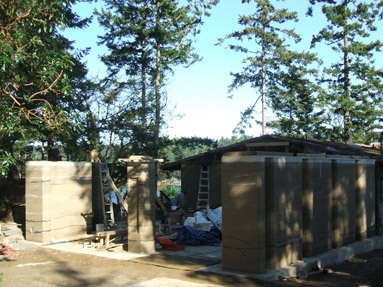 The rammed earth walls from the south east. The walls for the garage are almost done. 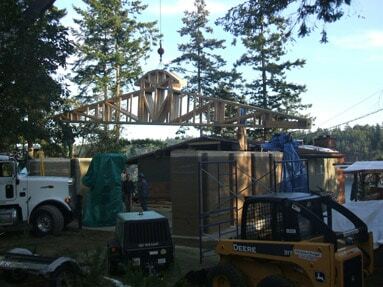 The crane is lifting the first bundle of trusses onto the walls. 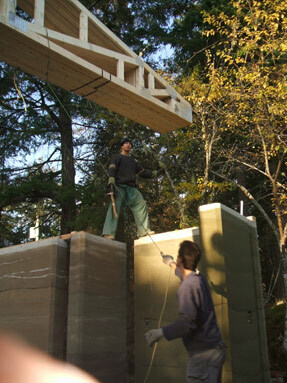 Guiding the bundle of trusses onto the walls. 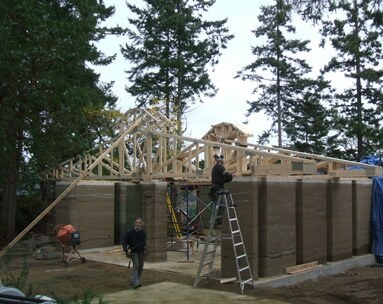 The layout of the roof trusses begins. The roof sheeting being installed. Yashwant working on the facade.